A while back I posted a flasher circuit which flashed 10 LEDs sequentially. That circuit was powered by four AA alkaline cells. 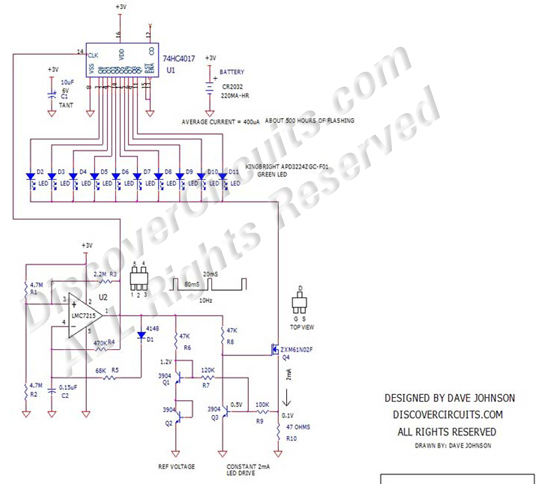 The circuit below operates much the same way but has been modified to run from a single 3v CR2032 lithium coin cell. The average battery current drain is a low 400uA. Yet, by using some super bright green surface mounted LEDs from King Bright, the effect is quite impressive even if each LED is driven with only 2ma of current. The circuit completes a cycle of the 10 LEDs once each second. A LMC7215 low power voltage comparator is configured as a 10Hz 20ms pulse generator. This 10Hz clock is fed to a 74HC4017 decade counter. The 4017 is unique in that it has 10 outputs which turn on sequentially with each leading edge of the clock input. The LEDs are all ganged together and connected to a constant 2ma sinking current circuit. As the battery voltage drops, the circuit will maintain a constant 2ma of current. The 10 LEDs can be configured into a loop or a line. A loop display might be handy for dog collars. A line mode can convey a right or left pointing direction. Text & Graphics Copyright © of David A. Johnson, P. E. -- ALL rights reserved, NO EXCEPTIONS!